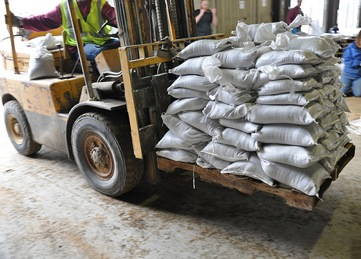 Sandbags are a simple and effective way to prevent or reduce the damage caused by flooding. When filled and placed properly sandbags can act as a barrier to divert the flow of water around, instead of through, a building. As one would imagine, sandbag construction does not guarantee a water-tight seal, however, it is satisfactory for most applications. It is especially effective when combined with a pump to extract the water that does leak through. Sandbags are also commonly used to prevent the overtopping of streams with levees, and for diverting current flows to a specific location. Click here for a handy guide on the proper usage of sandbags. They come palletized, ready for storage and placement. Each circumstance is individual, so please call for input. We would suggest that you purchase plastic as well. What do I do about cleanup? We can provide pricing on a case by case basis, so please call when the time comes. Can I bag my own sand? Our bags are 1600 hour UV bags.